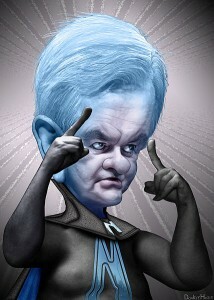 I must say, I’m befuddled by Newt Gingrich sometimes. When I hear nonsense like this from Waters and other foolish people on the left I say, keep it up. Let their idiotic statements keep piling up until they drown in it. You don’t have to respond. “And so, she meant it in the sense of hitting, you know — hitting in the ring,” Gingrich said. “First of all, let me just say — you’d never get it to happen, but the idea of a round between her and Donald Trump is pretty interesting. “Yeah, but if he was confronted with her, he would be very pleasant until she hit him, and the second she hit him, he would knock her down,” Gingrich said. I know he meant nothing by it, but why say anything remotely like that. He could have easily just said, “That’s Maxine Waters, ’nuff said”.